Our aquatic harvesters are hydraulically driven with reciprocating knives mounted on the harvesting head on both sides and bottom, to cut the aquatic vegetation. 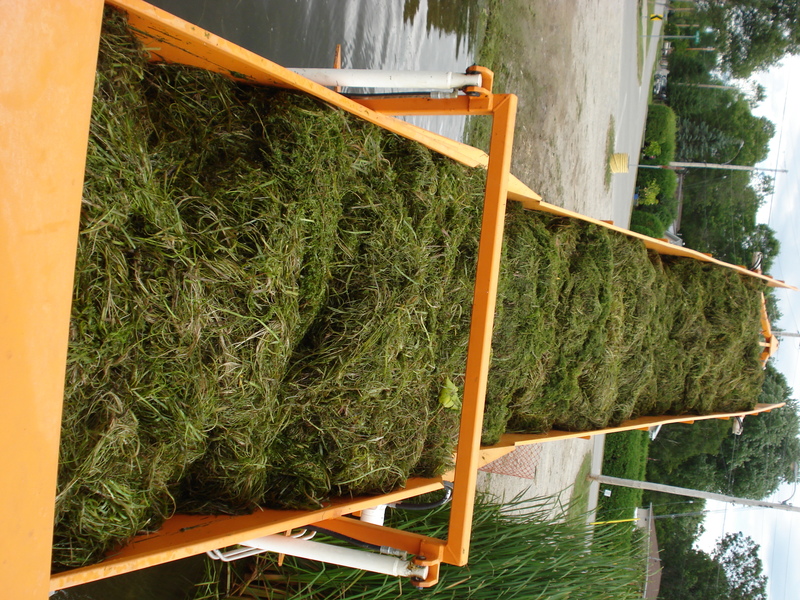 The vegetation is then transferred onto the head conveyor with enclosed sides to contain discharge back into the water then discharge onto a hydraulically driven storage conveyor located below the operator’s control tower. As the storage conveyor becomes filled with tightly packed aquatic vegetation, the harvested biomass is then transferred to a shoreline conveyor for subsequent removal via truck or roll-off box to a disposal or composting site. 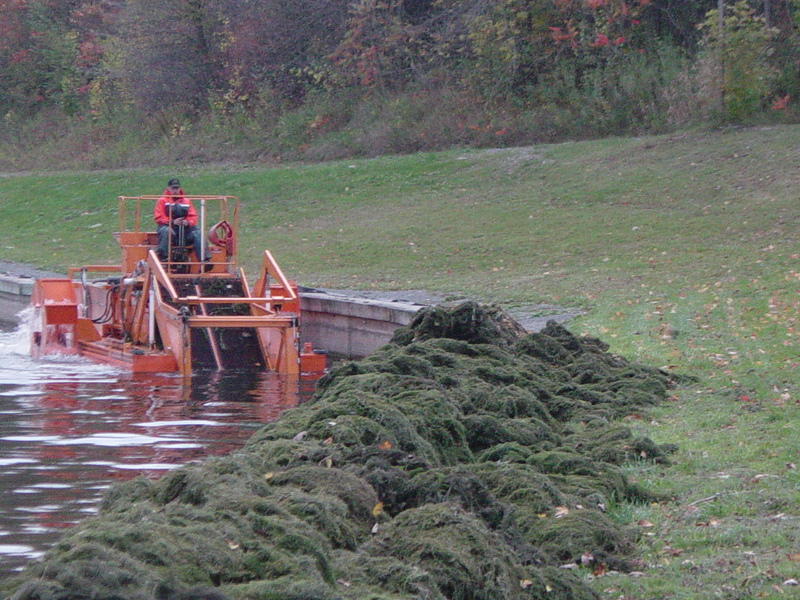 Inland Aquatics’s aquatic weed harvesters can harvest between 5-6 feet down from the water’s surface. This is the typical operating depth for harvesting and cutting a swath of vegetation, 7 feet wide. 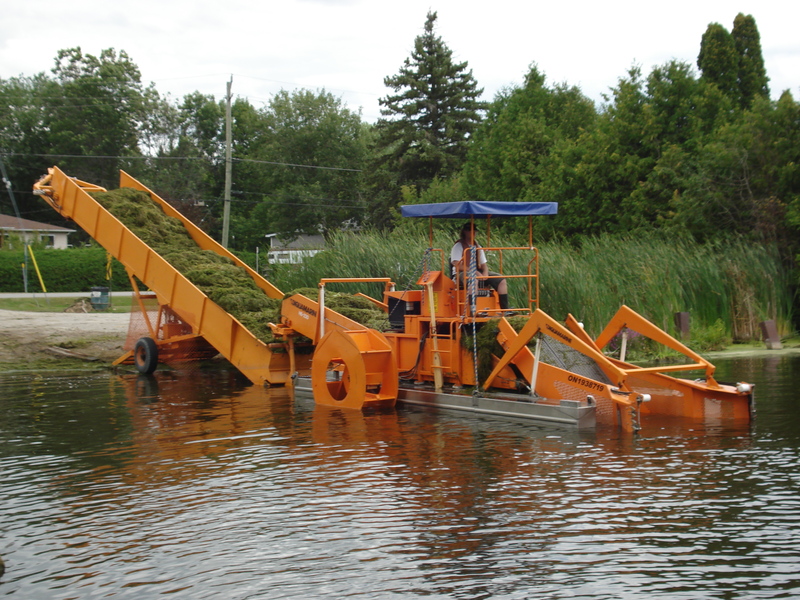 Our main harvester can store up to 230 square feet of biomass before having to off-load to shore. 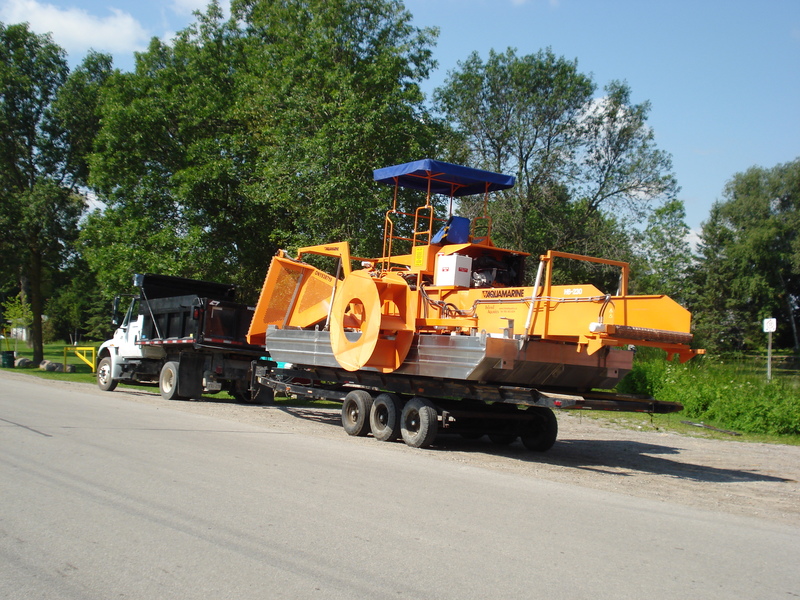 It has the capability to off-load onto a shoreline conveyor, tractor/tractor loader bucket or temporary off-loading directly to a shoreline. 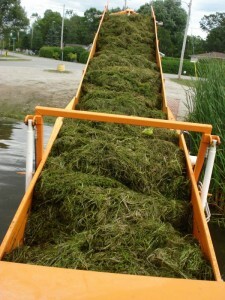 It is required that the harvested biomass be moved to a location above the high mark. Some of our customers request we leave the vegetation on shore as it can be used in composting. 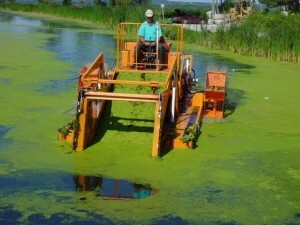 Aquatic vegetation, in many cases, has a higher nutrient content comparable to that of cow manure. A shore line conveyor can be set up to off-load harvested aquatic vegetation onto. This will then convey the vegetation into awaiting trucks or disposal boxes. 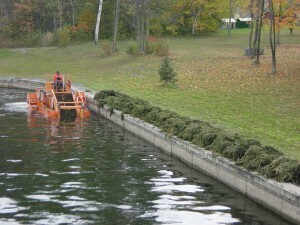 Other alternative removal equipment can be utilized for your particular project. Contact us for more information. Permits are required from local conservation or other government agencies that have control over your local water body. Please contact them to determine if you require permits for the work in your area. 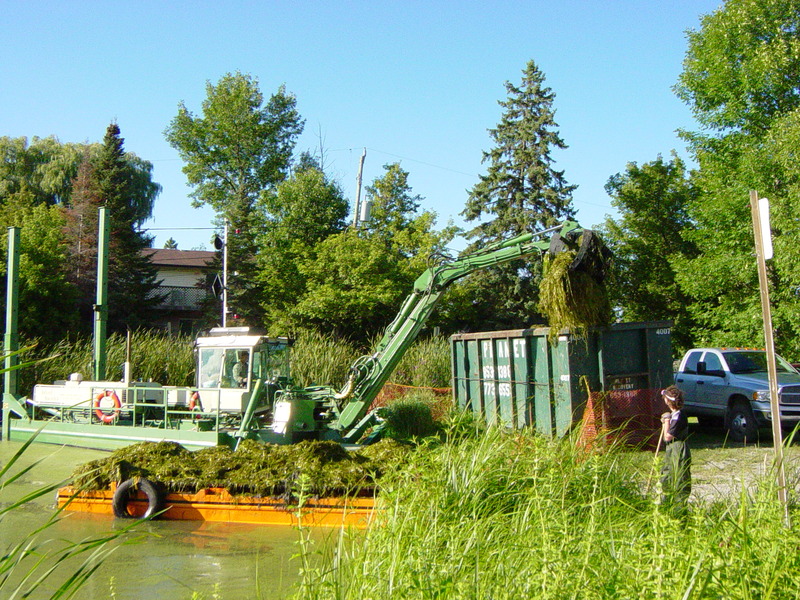 In many areas of Ontario, harvesting is not permitted until after July 1st due to fish spawning. If a permit is required, it must be obtained from your local authority before work can commence. Decomposing algae and plants also contribute to oxygen depletion under the ice during the winter months. When the plants die, bacteria and fungi breakdown the decaying aquatic material. This process requires oxygen in the process. Which removes existing lake and river oxygen thus removing needed oxygen for the creatures living in the water body. Oxygen depletion can also occur when algae or free-floating plants such as duckweed or aquatic plants completely cover the water’s surface. These surface growths reduce the amount of light that can penetrate the water, inhibiting photosynthesis (oxygen production) of plants in deeper waters. Anything that brings these de-oxygenated waters to the surface (such as a strong wind) can lower oxygen levels throughout the water column, which can result in fish kills. Even if it doesn’t kill the fish, prolonged exposure to low oxygen concentrations can also impact the aquatic environment, making them susceptible to diseases. Inland Aquatics has commercial, mechanical harvesters and a walking dredge to assist with major plant infestations or major floating weed mats. Not to mention dredging and digging operations both on land and in the water.